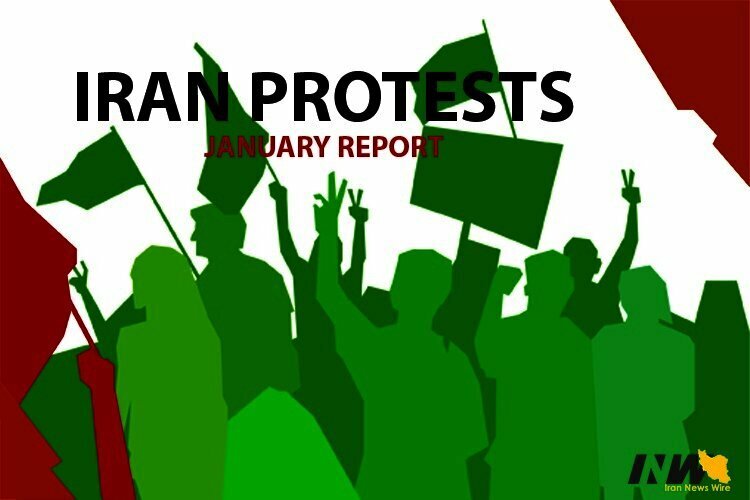 There were more than 271 Iran protests in 72 cities, villages, and industrial areas in Iran in the month of January with an average of nine protests per day. The reason for the relatively low number of protests was in part due to a temporarily granting of some of the worker’s requests including a few months of their unpaid wages and also as a result of the systematic suppression and arrests of protesters. Cold weather conditions and snow in some areas also hindered rallies. Workers held more than 102 rallies. Creditors, who have lost their savings to regime affiliated credit institutions, held 15 rallies. Prisoners had seven acts of protests. There were six instances of hunger strikes in prison. Other sectors held 82 rallies. Workers held more than 192 protest rallies in 41 cities, industrial centers and towns in January with an average of three protests per day. The protests were centered around unpaid wages, hiring conditions, lay off of workers, the uncertain state of workers and livelihood conditions. Creditors held 15 rallies in six Iranian cities. The creditors protested and demanded their savings from the Revolutionary Guards affiliated Caspian Credit Institution in Tehran, Rasht, Mashhad and Kerman, Padideh Tourism in Mashhad, Badre Tous in Mashhad, Talaye Samen in Tehran, Padideh Institution in Tehran and Mashhad, Kerman Motor in Tehran, the Vermicompost Company in Dezful and the Isfahan Town Building project. Pensioners held 11 protests in three cities. They were protesting not receiving their pensions and their dire livelihood conditions in Tehran, Mashhad and the southern town of Shush. Teachers held 18 protests in eight cities. They were protesting their livelihood conditions, lack of job security, not being hired officially and not receiving their salaries. The teachers held protests in Isfahan, Ardabil, Karaj, Khoram Abad, Yazd and Baghmalak in the southern province of Khuzestan. Students held eight protest rallies in five universities including Tehran’s Tarbiat Modares University, Farhangian University and the Shiraz Medical Sciences University. Farmers held 20 protest rallies in six cities in protest to lack of water. Rally by employees of the National Iranian Oil Company in protest to their livelihood conditions. Three day rally by people in Sistan and Baluchestan Province in protest to the regime’s failure to finish the Zabol-Zahedan highway project. Gathering by the families of detained National Steel Company workers in Ahvaz. Gathering by the families of the victims of the Sanchi oil tanker disaster demanding the bodies of their loved ones. Open letter by political prisoner Payam Shakiba in reaction to the death of students in a bus accident. Open letter by political prisoner Golrokh Iraie in relation to the limitations and pressures that the Iranian people have endured for years. Open letter by political prisoner Saied Masouri in protest to the condition of prisons. Open letter by three female political prisoners in protest to the state of the economy and the people’s dire livelihood conditions. Open letter by political prisoner Majid Assadi titled, “The history of our generation is teeming with torture”. Open letter by political prisoner Hassan Sadeghi in support of tortured labor activist Esmail Bakhshi. Open letter by two female political prisoners, Yasaman Ariaie and Saba Kord Afshari, in reaction to a report by the state-run Iran newspaper saying that political prisoners were kept in suitable conditions. Political prisoner Alireza Tavakoli in protest to unsanitary prison conditions, lack of medical attention and not being transferred to the hospital. Political prisoner Nasrollah Lashani in protest to being mistreated by prison guards and a ban on visiting rights. Political prisoner Mehdi Khanomi Pour in protest to not being able to participate in his father’s funeral. Political prisoner Abbas Lesani in protest to his arrest. Security prisoner Mahmoud Naji in protest to his requests not being met. Political prisoner Samad Farhadi in protest to being transferred to solitary confinement.